Shortly after a concert, Eminem and his security are approached by a man cloaked in shadow. 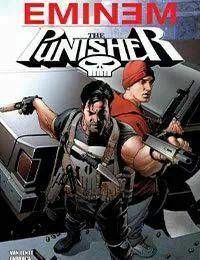 Eminems security threatens him only to realize it is the Punisher. Eminem runs and is intercepted by Barracuda, who fools him into believing that he is on his side. Eminem pistol whips the Punisher and shoots him only to be blindsided by Barracuda. Eminem finally realizes who is on his team and kills Barracuda.